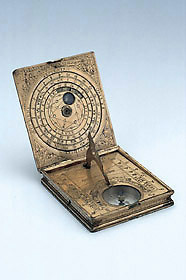 This compendium contains a nocturnal, a lunar volvelle, an inclining sundial, a compass and a table of latitudes. Apart from telling the time, its sundial also indicates which sign of the zodiac the sun is in. Given the sun's position in the zodiac the nocturnal's volvelle can be used to display the time of sunrise and sunset throughout the year for four selected latitudes (42, 44, 46 and 48?). However, the sundial can be used in a wider range of latitudes, from 38 to 54?. Ulrich Schniep was one of the major instrument makers in later 16th-century Munich.